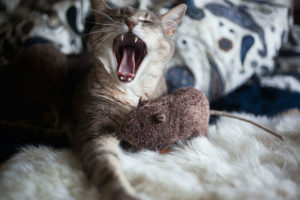 There are a lot of cat products I’m waiting to move to a house to try out: massive cat jungle gyms, automatic litter boxes, a plethora of electronic cat toys – even outdoor cat houses I wouldn’t mind sticking inside because of how nice they look. Living and working full time in a studio-flat means, if I bought all the cat stuff I wanted, this small space would feel “littered” and cramped with stuff in no time – and yes, the pun was intended. Doesn’t stop a girl from adding items to her wishlist, though. When I moved to this small flat, hidden cat litter boxes were an option I considered. The only issue: a lot of the boxes I liked were hidden in furniture that’s a little on the big side, and I really don’t have that kind of space. 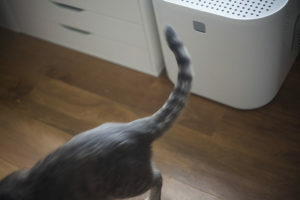 What I chose to do instead was grab the prettiest top-entry cat litter box I could find – the Modkat Litter Box (reviewed here). 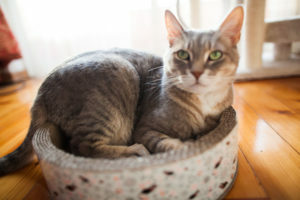 In my opinion, it’s been the perfect addition to my home, partly because it meant I could skip out on litter mats, which take up quite a bit of space, and partly because it aesthetically fits in perfectly with my all-white furniture. 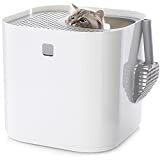 There are a lot of benefits to top entry litter boxes I’ve discovered having used my Modkat since then, but that doesn’t stop me from wanting to test out other varieties of kitty restrooms: especially automatic litter robots and hidden-in-furniture litter boxes like these. 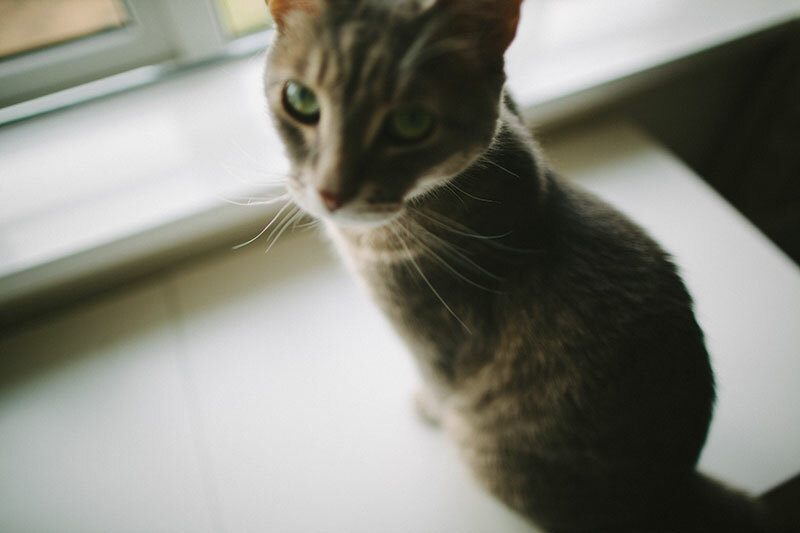 Some of the benefits I appreciate about top entry litter boxes: litter reduction, aesthetic appeal (of course! ), and space conservation. 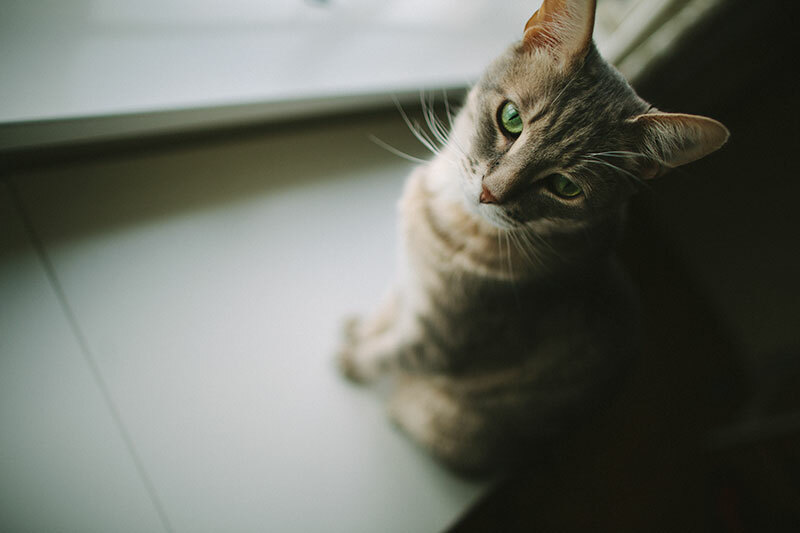 In some cases, these are all perks of cat litter boxes hidden in furniture as well, especially in the case of #2 listed below. Doing some digging, I found a few different “favourites.” There are so many colour variations and styling types, I think I’d be hard pressed not to find something that didn’t suit my home aesthetically, no matter which way I chose to furnish it. Awesome, because who wants to buy furniture that matches a litter box, rather than the other way around. 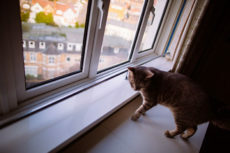 Oh and, in case you’ve already got furniture you think would be an amazing fit to hide a litter box, and simply want to allow kitty access to the inside of that without having to leave a door ajar – you should definitely consider integrating an interior cat door like the Purrfect Portal on that piece of furniture. 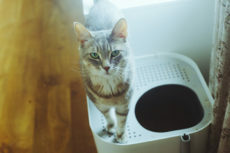 Heck, you can even use one of those to hide the litter box you’ve already got in a closet – the perfect litter box placement for small apartments, especially if you’ve got a cat who’s picky about the litter box he or she uses, and have already got the perfect box. But enough of a preable, let me show you my favourite hidden litter boxes already. Do let me know which you personally like best in the comments! 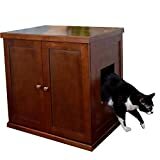 If you’re looking for the most undercover hidden-in-a-cabinet litter box you can find, coupled with enough features and options that it’d be convenient to have no matter where want to put it, I think this is probably your best bet. A lot of hidden litter boxes open from the front. That’s not ideal if you really want the facade of your furniture being human furniture and not cat furniture. A lot of hidden litter boxes also don’t give you the option for extra storage. This one does, with a convenient hidden drawer at the top for your litter scooper and anything else you might like to have in it (litter bags, maybe?) at the top. 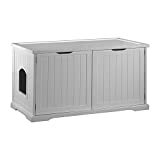 Of course, like most side-entry hidden litter box furniture, this dresser gives you the option of whether to have the hole on the left or right, meaning it’s incredibly easy to move it wherever you want to, changing up the side the entrance is on as you see fit. 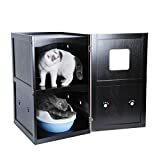 It comes with a high litter liner box already, and it even comes with a wood litter catcher, that looks so extremely convenient, and of course matches perfectly with the furniture. Really nice combo. To top it off? Has slots for two standard-sized carbon filters at the back. Excellent if you have issues with litter smells. Comes in two different sizes. Also comes in espresso black on top of this pretty mahogany colour, which is awesome since colour options are the kind of thing I’d take advantage of to make sure cat furniture matched the room it was in. Options galore. This two-story hidden litter box is like a top entry litter box on steroids. Which I obviously love, since I adore my own top entry litter box. 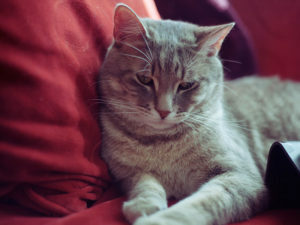 Your cat goes in from the top, hops down to the bottom section through a nice little hole, does his or her business, jumps back up to the top portion, then goes out. While my Modkat is very good at tracked litter reduction, it’s not perfect because Avery’s a bit of a psycho. 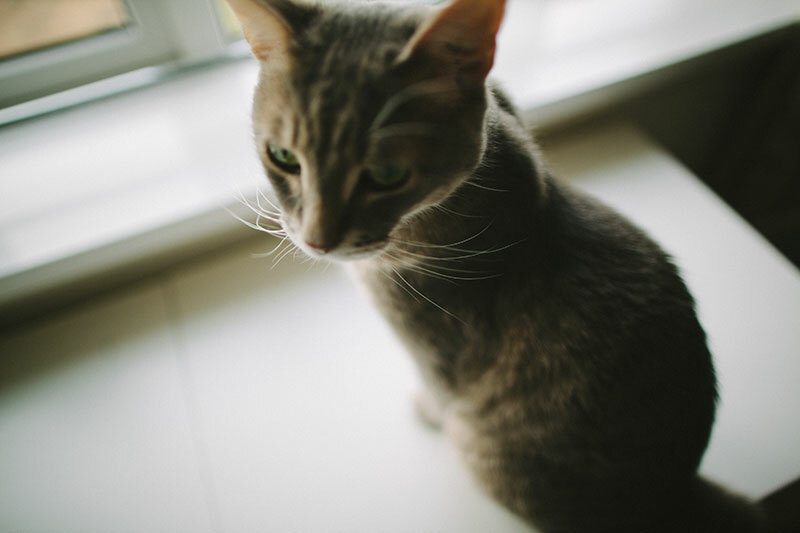 He’ll sometimes literally jump over the top of the litter box, straight into the room, sparkling World’s Best Litter all over the floor behind him. Yes, leave it to cats to find a way to defy the purpose of the cat stuff you buy them, but hey, can’t blame ’em for their quirks! Either way, this hidden litter box would solve this problem for me almost completely. I’d have a high quality litter mat on the top to catch stray litter, and he’d have to go through that top section to get out, so he’d be forced to get his paws mostly clean before running out of the litter box furniture. Perfection. 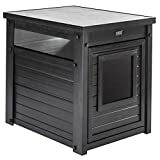 A reviewer on Amazon actually has put together an interesting set-up with this hidden litter box. She uses the top section to hide her cats’ water and food bowls as well. Very clever since it prevents her dog from being able to get at it, as she stated he normally would when food and water dishes were left out! Check out the pictures in that review if you’re interested in doing the same. Also comes in white on top of that espresso black, in case that’s more suited to your home! Just wanted to note, Trixie also makes a version of this double-decker hidden litter box, in case that one is more up your alley. Personally, I don’t think I’d ever buy this hidden litter box, but I thought it was too cute not to share! A hidden litter box in an artificial potted plant’s base? Love the idea! What I don’t love? The fact that I’d still have to put a litter mat in front of it, and since Avery can be quite of a mess maker when it comes to toilet time (he likes to dig a little too much! ), I think we’d probably run into some clean up issues with this one. Still a great idea, however! And probably wouldn’t mind it in a tiled bathroom or a sun room. Another litter box I probably wouldn’t get for the absolute same reason: it’s super cute, but I’d have to use it with a litter mat out in front of it with the way Avery uses the loo, and that just isn’t my jam! Obviously, I’m in the minority, however, because this is one popular hidden litter box! I think it may be the most popular one on Amazon. Comes in espresso brown, beige, walnut, and white – all gorgeous options and obviously good to have variety to pick from when you’re matching to your restroom. I think the thing that makes this one stand out amongst the others is how good it would look in pretty well near any bathroom. It’s got an optional bar for a hand towel that can be placed on either side, storage for a showpiece towel just above it. Honestly, it’d probably match so well to any bathroom it’d look like you had it custom built. Of course you don’t have to place it in a bathroom since the railing for the hand towel isn’t mandatory. Can easily place it in a living room or even a bedroom and house some decorative books in the upper section, with a nice lamp on top. Hard not to see why it’s popular, especially at such a reasonable price. I can’t explain how much I love this hidden litter box, and I’d guess if I was to go out and immediately buy a hidden litter box once I moved to a house, it’d either be this option, or #7. I love the fact that this hidden litter box can double as a seating bench. I’d probably go so far as to DIY a little pillow cushion for the top, so I or my kitties could have a seat on it very comfortably. 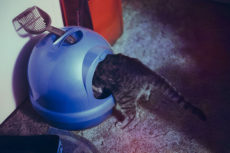 The top opens up so you can clean out the litter, inside, there’s a spot to hang your scooper, and it has a compartment your cat has to walk through before entering the litter box section, which is perfect for placing a litter mat in. Obviously, I love the fact that the litter mat is concealed with this setup – very important to me as you no doubt already realize. Opens on either side, so you can easily put the seating bench wherever you’d like. Comes in espresso brown, black, and white. What’s more to say? It’s a pretty little thing, in my opinion, which, besides minimizing mess, is the most important aspect of a hidden litter box to me. 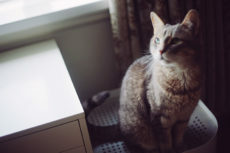 Looking for a litter box that’s, for all intents and purposes, an extra side table you could use in your bedroom or living room? This is where it’s at. Pretty attractive, if you ask me, would match any theme, but again, you need to put a litter mat in front of it if you have a messy fella on your hands like my Avery, so keep this in mind if it’s something you have to consider. Comes in antique white, grey, espresso black, and russet brown, as well as two different sizes. I go back and forth between this litter-box-in-a-bench and the one from #5 when considering which I’d prefer to buy for Avery. In terms of colour – this one only comes in white and walnut, but if the colour options were fine (and let’s be honest, I can always paint it to match my furniture), I’d still be torn between the two. They advertise this hidden litter box as a washroom bench, but I don’t think I’d mind having this elsewhere in the house, since I feel it looks normal enough as a bench in the kitchen or a lobby, for instance. This hidden cat litter box is likely less easy to scoop litter out of, considering you have to stoop down and clean from the side, rather than cleaning out of the top of the litter box (something I’ve spoiled myself with in terms of convenience since grabbing my Modkat). But this one is a lot more versatile than the other, allowing you to block off part of the inside of the bench with a partition, which you can then use to hide an open bag of litter – so convenient! If you’d rather, you can also completely remove the partition, opening up the bench completely so you can have one really long litter mat, which would reduce litter tracking outside this bench almost completely I’d think. 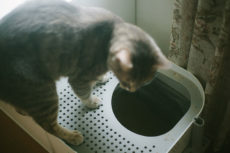 Or, you could use the extra space to place a full-sized side entry litter box, rather than a litter tray if you wanted. Hard to choose, but I think I might pick this one considering the versatility. I’d be tempted to try finding an automatic litter robot that’s small enough to fit into it. That plus the long litter mat, I think the work-reducing combo would be hard to beat. Your Thoughts on Hidden Litter Boxes? Are you excited like I am about all the cool cat products there appear to be on the market these days? 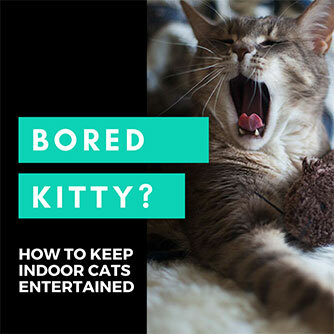 Think you may one day take advantage of that in the hidden litter box department? Would you ever custom make furniture to hide litter boxes? I wish I was talented enough to DIY something like this myself! Think it’d be worth getting a cute hidden litter box, even if you have to put a litter mat out in front of it, or do you prefer the ones with concealed or matching litter mats like I do? Great feature on disguised litter trays! I’ve seen a lovely unit that would fit in with your article! It’s available from Cat Tree UK and if you use the promo code ‘gizmo’ you can save money on in stock products! Take a look at https://cattree.uk/product/kerbl-helena-cat-unit/. Wow! It’s quite interesting all these litter boxes that people do come up with. 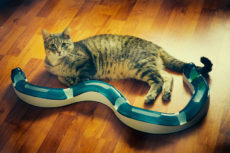 Very very cool..now a hidden cat litter box! It is crazy the products that come out these days! Can’t wait to get my hands on one of these! That’s so good of you not to get into the litter boxes, Dennis! Makes life easier for dad I’m sure since he has to keep the litter boxes out now for the Hipster Kitties! 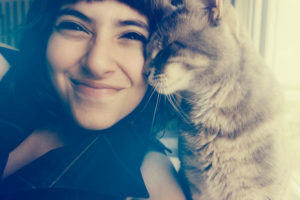 Really good thing to think about with regards to aging cats maybe not being able to use hidden litter boxes so well in their old age. Interesting! We use super huge litter boxes, and lots of them. That’s really good that it doesn’t track a ton of litter. Curious to know what kind of litter you use though, I’ll probably go digging on your website after this to find out! Didn’t think about the size of the kitty making much of a difference, probably because I’m terrible at visualizing how big things are and so I expected that one to be quite big (or well, big enough for even large cats). Thanks for the tip! The extra storage is a pretty great enhancement, and I’m glad it’s held up well! Thanks for the thumbs up of approval – it’s always good to know what others have tried and would recommend! Oh my gosh, it’s kind of crazy to see all the different types of litter boxes they’ve come up with. Yeah, some are pretty darn cool!